Woohoo! A La Creme Coupon is finally available. I have been waiting for this for a while. 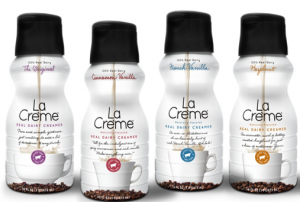 The coupon is for $0.55 off any La Creme Product. You will have to “like” La Creme on Facebook in order to print your coupon. Of course you all know I’ll be using this the second the coffee creamer goes on sale. Woot!! Can’t wait to try it.